For and introduction to what constitutes a long filename and why they should be avoided see: Long Filenames - How long is too long on our blog. 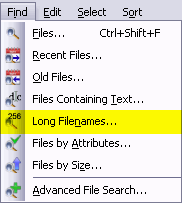 Select Find | Long Filenames... or (Alt+I,N) from the main menu to open the dialog where you can specify exactly which files you want to find. FileBoss remembers what has been searched in the past even when it has been closed and then started again so you can always select a previous entry using the drop down list. Select the drives or paths you want to check. Multiple paths are separated with the semi-colon (;), comma (,) or bar character (|). You can even specify folders to exclude by preceding the name with a minus sign. For complete details right-click the field in the program. Then select which length you want to find and enter the number of character. Normally it the Path + Name, i.e. the total length, that you will want to find. In the above example FileBoss will find all files C drive and on a network beginning with the folder \\CorpNet\c\Backup\Design except for any folder named Windows and all of its subfolders. The search will be for filenames with a total length of 255 characters or longer. Both the paths and file patterns fields can accept either simple entries, e.g. C\Data\My Data and *.bmp or very complex strings that specify not only what to include but also what to exclude from a, most typically, search. For a complete description of these fields either right-click the mouse over the fields for context help from within FileBoss or see Advanced Paths & Patterns. Make sure that the column for showing the column for showing the filename length your are interested in is visible (if not see the next section for how to display the column). Click on the appropriate column header to sort all entries by the length. Click the column header again to reverse the sort order. If you are in Explore View then as you move from folder to folder the files will remain sorted according to chosen time. Hint: If you are looking at folders that contain lots of files you can and you know the extension or possible extensions of the file(s) you are looking for you can use a File Filter to only display those files. Or you can even used Advanced Filtering to only show files with Modified times in the range you want. This works the same in both Explore Views and Virtual File Sets. Check the boxes next to items you want displayed. Click the Close Menu button. Hint: You can change the order of the columns by clicking a header with the left mouse button and, while holding the mouse button down, dragging the column to its new location. Note that when renaming files to make the total path length shorter it is often convenient to rename one of the folder names. Just make sure that renaming the folder won't break any of the other programs on you system. or if the files can be renamed in groups, press Ctrl+R and use one of FileBoss's powerful renaming tools. Click here for more about FileBoss's powerful renaming facilities.